This article is about the city of Islamabad. For other uses, see Islamabad (disambiguation). Islamabad (/ɪzˈlɑːməˌbɑːd/; Urdu: اسلام آباد‎, Islāmābād, Urdu pronunciation: [ɪsˌlɑːmɑˈbɑːd̪]) is the capital city of Pakistan located within the federal Islamabad Capital Territory. With a population of two million, it is the 10th largest city of Pakistan, while the larger Islamabad Rawalpindi metropolitan area is the third largest in Pakistan with a population exceeding five million. The city is the political seat of Pakistan and is administered by the Islamabad Metropolitan Corporation, supported by the Capital Development Authority (CDA). Islamabad was built during the 1960s to replace Karachi as Pakistan's capital. The city's master-plan divides the city into eight zones, including administrative, diplomatic enclave, residential areas, educational sectors, industrial sectors, commercial areas, and rural and green areas. 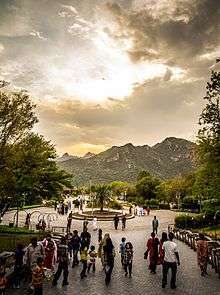 The city is known for the presence of several parks and forests, including the Margalla Hills National Park and Shakarparian Park. 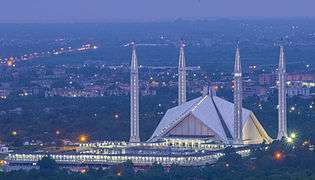 The city is home several landmarks, including the Faisal Mosque, the largest mosque in South Asia and the fourth largest in the world. 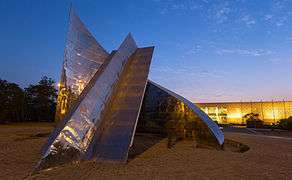 Other landmarks include the Pakistan's National Monument and Democracy Square. Islamabad is ranked very high on the Human Development Index, equivalent to that of Belgium. The city has the highest cost of living in Pakistan, and its population is dominated by middle and upper middle class citizen's. The city is home to sixteen universities, including the Quaid-e-Azam University and NUST. The city is one of the safest in Pakistan, and has an expansive surveillance system with 1,900 CCTV cameras. The name of the city, Islamabad is derived from two words, Islam and abad, meaning "City of Islam". Islam is an Arabic word which refers to the religion of Islam and -abad is a Persian place name that means inhabited place or city. Excavations have revealed evidence of a prehistoric culture. Relics and human skulls have been found dating back to 5000 BC that show this region was home to Neolithic people who settled on the banks of the Swaan River, who developed small communities in the region at around 3000 BC. One end of the Indus Valley Civilization flourished here between the 23rd and 18th centuries BC. Later the area was an early settlement of the Aryan community. A Buddhist town once existed in the region. Many great armies such as those of Zahiruddin Babur, Genghis Khan, Timur and Ahmad Shah Durrani used the corridor through Islamabad on their way to invade the rest of the Indian Subcontinent. Modern Islamabad is based on the old settlement known as Saidpur. The British took control of the region from the Sikhs in 1849 and built South Asia's largest cantonment in the region. 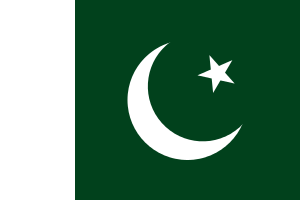 When Pakistan gained independence in 1947, the southern port city of Karachi was its first national capital. In the 1960s, Islamabad was constructed as a forward capital for several reasons. Traditionally, development in Pakistan was focused on the colonial centre of Karachi, and President Ayub Khan wanted it equally distributed. Moreover, Karachi having tropical weather conditions, was located at one end of the country, making it vulnerable to attacks from the Arabian Sea. Pakistan needed a capital that was easily accessible from all parts of the country. Karachi, a business centre, was also considered unsuitable partly because of intervention of business interests in government affairs. The newly selected location of Islamabad was closer to the army headquarters in Rawalpindi and the disputed territory of Kashmir in the north. In 1958, a commission was constituted to select a suitable site for the national capital with particular emphasis on location, climate, logistics, and defence requirements along with other attributes. After extensive study, research, and a thorough review of potential sites, the commission recommended the area northeast of Rawalpindi in 1959. A Greek firm of architects, Konstantinos Apostolos Doxiadis, designed the master plan of the city based on a grid plan which was triangular in shape with its apex towards the Margalla Hills. The capital was not moved directly from Karachi to Islamabad; it was first shifted temporarily to Rawalpindi in the early sixties and then to Islamabad when the essential development work was completed in 1966. Islamabad has attracted people from all over Pakistan, making it one of the most cosmopolitan and urbanised cities of Pakistan. As the capital city it has hosted a number of important meetings, such as the South Asian Association for Regional Cooperation summit. Year 2014 has brought in major changes in Islamabad. Construction of the Rawalpindi-Islamabad Metrobus began on 28 February 2014 which was completed in March 2015, with 60 buses plying on the route. The Rawalpindi Development Authority lookafter the project with a cost of approximately Rs 24 billion, which was shared by both the Federal government and the provincial government of Punjab. In October 2005, the city suffered some damage due to the 2005 Kashmir earthquake which had a magnitude of 7.6. Islamabad has experienced a series of terrorist incidents including the July 2007 Siege of Lal Masjid (Red Mosque), the June 2008 Danish embassy bombing, and the September 2008 Marriott bombing. In 2011, four terrorism incidents occurred in the city, killing four people, including the murder of the then Punjab Governor Salmaan Taseer. Tragic air crashes also took place here: on 28 July 2010, Airblue Flight 202 crashed in the Margalla Hills killing all 152 flight crew and passengers on board and Bhoja Air Flight 213 carrying 121 passengers crashed while making the final approach for landing, killing all on board on 20 April 2012. Islamabad is located at 33°26′N 73°02′E﻿ / ﻿33.43°N 73.04°E﻿ / 33.43; 73.04 at the northern edge of the Pothohar Plateau and at the foot of the Margalla Hills in Islamabad Capital Territory. Its elevation is 540 metres (1,770 ft). The modern capital and the ancient Gakhar city of Rawalpindi stand side by side and are commonly referred to as the Twin Cities, where no exact boundary exists between the two cities. To the northeast of the city lies the hill station of Murree, and to the north lies the Haripur District of Khyber Pakhtunkhwa. 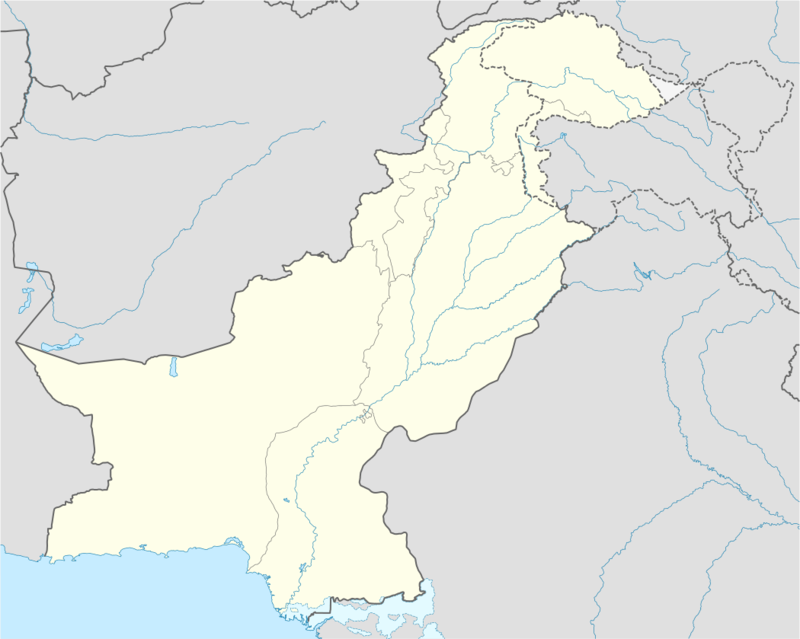 Kahuta lies on the southeast, Taxila, Wah Cantt, and Attock District to the northwest, Gujar Khan, Rawat, and Mandrah on the southeast, and the metropolis of Rawalpindi to the south and southwest. Islamabad is located 120 kilometres (75 mi) SSW of Muzaffarabad, 185 kilometres (115 mi) east of Peshawar, 295 kilometres (183 mi) NNW of Lahore, and 300 kilometres (190 mi) WSW of Srinagar, the capital of the Indian state of Jammu and Kashmir. The climate of Islamabad has a humid subtropical climate (Köppen: Cwa), with five seasons: Winter (November–February), Spring (March and April), Summer (May and June), Rainy Monsoon (July and August) and Autumn (September and October). The hottest month is June, where average highs routinely exceed 38 °C (100.4 °F). The wettest month is July, with heavy rainfalls and evening thunderstorms with the possibility of cloudburst and flooding. The coolest month is January. 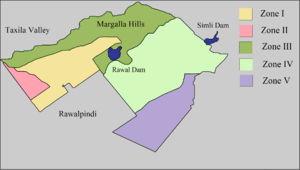 Islamabad's micro-climate is regulated by three artificial reservoirs: Rawal, Simli, and Khanpur Dam. The latter is located on the Haro River near the town of Khanpur, about 40 kilometres (25 mi) from Islamabad. 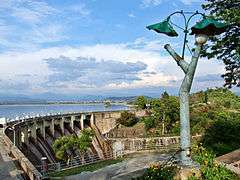 Simli Dam is 30 kilometres (19 mi) north of Islamabad. 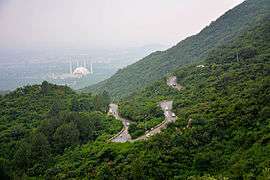 220 acres (89 ha) of the city consists of Margalla Hills National Park. Loi Bher Forest is situated along the Islamabad Highway, covering an area of 1,087 acres (440 ha). The highest monthly rainfall of 743.3 mm (29.26 in) was recorded during July 1995. Winters generally feature dense fog in the mornings and sunny afternoons. In the city, temperatures stay mild, with snowfall over the higher elevations points on nearby hill stations, notably Murree and Nathia Gali. The temperatures range from 13 °C (55 °F) in January to 38 °C (100 °F) in June. The highest recorded temperature was 46.6 °C (115.9 °F) on 23 June 2005 while the lowest temperature was −6 °C (21.2 °F) on 17 January 1967. The city has recorded snowfall. On 23 July 2001, Islamabad received a record-breaking 620 mm (24 in) of rainfall in just 10 hours. It was the heaviest rainfall in Islamabad in the past 100 years and the highest rainfall in 24 hours as well. The main administrative authority of the city is the Islamabad Metropolitan Corporation (IMC) with some help from Capital Development Authority (CDA), which oversees the planning, development, construction, and administration of the city. 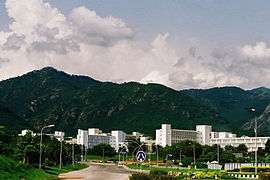 Islamabad Capital Territory is divided into eight zones: Administrative Zone, Commercial District, Educational Sector, Industrial Sector, Diplomatic Enclave, Residential Areas, Rural Areas and Green Area. Islamabad city is divided into five major zones: Zone I, Zone II, Zone III, Zone IV, and Zone V. Out of these, Zone IV is the largest in area. Zone I consists mainly of all the developed residential sectors while Zone II consists of the under-developed residential sectors. Each residential sector is identified by a letter of the alphabet and a number, and covers an area of approximately 2 km × 2 km ( 1 1⁄4 mi × 1 1⁄4 mi). The sectors are lettered from A to I, and each sector is divided into four numbered sub-sectors. Series A, B, and C are still underdeveloped. The D series has seven sectors (D-11 to D-17), of which only sector D-12 is completely developed. This series is located at the foot of Margalla Hills. The E Sectors are named from E-7 to E-17. Many foreigners and diplomatic personnel are housed in these sectors. In the revised Master Plan of the city, CDA has decided to develop a park on the pattern of Fatima Jinnah Park in sector E-14. Sectors E-8 and E-9 contain the campuses of Bahria University, Air University, and the National Defence University. The F and G series contains the most developed sectors. F series contains sectors F-5 to F-17; some sectors are still under-developed. 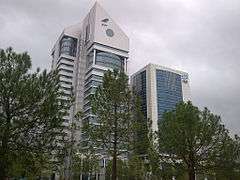 F-5 is an important sector for the software industry in Islamabad, as the two software technology parks are located here. The entire F-9 sector is covered with Fatima Jinnah Park. The Centaurus complex is a major landmark of the F-8 sector. G sectors are numbered G-5 through G-17. Some important places include the Jinnah Convention Centre and Serena Hotel in G-5, the Red Mosque in G-6, and the Pakistan Institute of Medical Sciences, the largest medical complex in the capital, located in G-8. Rawalpindi-Islamabad Metrobus near The Centaurus. 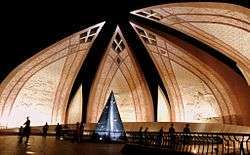 The murals on the inside of the large petals of Pakistan Monument are based on Islamic architecture. The Shah Faisal Mosque is a fusion of contemporary architecture with a more traditional large triangular prayer hall and four minarets, designed by Vedat Dalokay, a Turkish architect and built with the help of funding provided by King Faisal of Saudi Arabia. The architecture of Faisal Mosque is unusual as it lacks a dome structure. It is a combination of Arabic, Turkish, and Mughal architectural traditions. The Centaurus is an example of modern architecture under construction in Islamabad. The seven star hotel was designed by WS Atkins PLC. 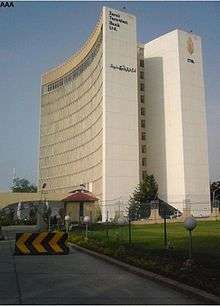 The newly built Islamabad Stock Exchange Towers is another example of modern architecture in the city. Islamabad had an estimated population of around 1.67 million in 2011 which according to the estimate of Population Census Organization will rise to around 2 million in 2020. Urdu, the national language of the country, is predominantly spoken within the city as well as English. The mother tongue of the majority of the population is Punjabi, at 68% and the major dialect is Pothohari dialect. 15% of the population are Pashto speakers, 18% speak other languages. The total migrant population of the city is 1 million, with the majority (691,977) coming from Punjab. Around 210,614 of the migrated population came from Sindh and rest from Khyber Pakhtunkhwa, Azad Kashmir. Smaller populations emigrated from Federally Administered Tribal Areas, Balochistan, and Gilgit–Baltistan. 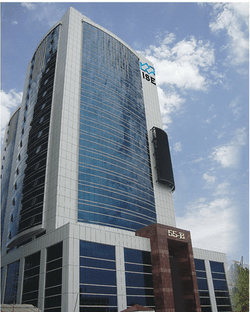 As of 2012, Islamabad LTU (Large Tax Unit) was responsible for Rs 371 billion in tax revenue, which amounts to 20% of all the revenue collected by Federal Board of Revenue. Islamabad has seen an expansion in information and communications technology with the addition two Software Technology Parks, which house numerous national and foreign technological and information technology companies. The tech parks are located in Evacuee Trust Complex and Awami Markaz. Awami Markaz houses 36 IT companies while Evacuee Trust house 29 companies. Islamabad is home to many migrants from other regions of Pakistan and has a cultural and religious diversity of considerable antiquity. Due to its location on the Pothohar Plateau, remnants of ancient cultures and civilisations such as Aryan, Soanian, and Indus Valley civilisation can still be found in the region. A 15th-century Gakhar fort, Pharwala Fort, which was built on the remains of a 10th-century Hindu fort, is located near Islamabad. Rawat Fort in the region was built by the Gakhars in 16th century and contains the grave of the Gakhar chief, Sultan Sarang Khan. 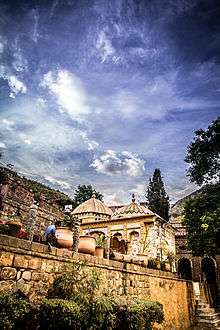 Saidpur village is supposedly named after Said Khan, the son of Sultan Sarang Khan. The 500-year-old village was converted into the a place of Hindu worship by a Mughal commander, Raja Man Singh. He constructed a number of small ponds: Rama kunda, Sita kunda, Lakshaman kunda, and Hanuman kunda. The region is home to many Hindu temples that are preserved, showing the history of Hindu civilisation and architecture in the region.. The shrine of Sufi mystic Pir Meher Ali Shah is located at Golra Sharif, which has a rich cultural heritage of the pre-Islamic period. Archaeological remains of the Buddhist era can also still be found in the region. The shrine of Bari Imam was built by Mughal Emperor Aurangzeb. Thousands of devotees from across Pakistan attend the annual Urs of Bari Imam. The event is one of the largest religious gatherings in Islamabad. In 2004, the Urs was attended by more than 1.2 million people. Islamabad boasts the highest literacy rate in Pakistan at 88%, and has some of the most advanced educational institutes in the country. A large number of public and private sector educational institutes are present here. The higher education institutes in the capital are either federally chartered or administered by private organisations and almost all of them are recognised by the Higher Education Commission of Pakistan. High schools and colleges are either affiliated with the Federal Board of Intermediate and Secondary Education or with the UK universities education boards, O/A Levels, or IGCSE. According to Academy of Educational Planning and Management's report, in 2009 there were a total of 913 recognised institutions in Islamabad (31 pre-primary, 2 religious, 367 primary, 162 middle, 250 high, 75 higher secondary and intermediate colleges, and 26 degree colleges). There are seven teacher training institutes in Islamabad with a total enrolment of 604,633 students and 499 faculty. The Gender Parity Index in Islamabad is 0.93 compared to the 0.95 national average. There are 178 boys only institutes, 175 girls only, and 551 mixed institutes in Islamabad. Total enrolment of students in all categories is 267,992; 138,272 for boys and 129,720 for girls. There are 16 recognised universities in Islamabad with a total enrolment of 372,974 students and 30,144 teachers. Most of the top ranked universities; National University of Sciences and Technology, COMSATS Institute of Information Technology and Pakistan Institute of Engineering & Applied Sciences, also have their headquarters in the capital. The world's second largest general university by enrolment, Allama Iqbal Open University is located in Islamabad for distance education. Other universities include Air University, Bahria University, Center for Advanced Studies in Engineering, Federal Urdu University of Arts, Science and Technology, Hamdard University, National University of Computer and Emerging Sciences, Capital University of Science & Technology, National Defence University, Shifa Tameer-e-Millat University, National University of Modern Languages, Iqra University, International Islamic University, Virtual University of Pakistan, Muhammad Ali Jinnah University and The Millennium University College. PAEC General Hospital and teaching institute, established in 2006, is affiliated with the Pakistan Atomic Energy Commission. The hospital consists of a 100-bed facility and 10 major departments: Obstetrics and Gynecology, Pediatric, General Medicine, General Surgery, Intensive Care Unit/Coronary Care Unit, Orthopedics, Ophthalmology, Pathology, Radiology, and Dental Department. Shifa International Hospital is a teaching hospital in Islamabad that was founded in 1987 and became a public company in 1989. The hospital has 70 qualified consultants in almost all specialties, 150 IPD beds and OPD facilities in 35 different specialisations. According to the Federal Bureau of Statistics of the Government of Pakistan, in 2008 there were 12 hospitals, 76 dispensaries, and 5 Maternity and Child Welfare Centers in the city with a total of 5,158 beds. Airports: Islamabad is connected to major destinations around the world through Benazir Bhutto International Airport, previously known as Islamabad International Airport. The airport is the third largest in Pakistan and is located outside Islamabad, in Chaklala, Rawalpindi. In fiscal year 2004–2005, over 2.88 million passengers used Benazir Bhutto International Airport and 23,436 aircraft movements were registered. Islamabad Gandhara International Airport is under construction at Fateh Jang to cope with the increasing number of passengers. When completed, the airport will be the largest in Pakistan. The airport will be built at a cost of $400 million and is expected to be complete and operational by 2016. 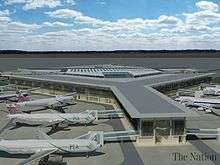 This will be the first green field airport in Pakistan with an area of 3,600-acre (15 km2). The Rawalpindi-Islamabad Metrobus is a 24 km (14.9 mi) bus rapid transit system that serves the twin cities of Rawalpindi and Islamabad in Pakistan. It uses dedicated bus lanes for all of its route covering 24 bus stations. All major cities and towns are accessible through regular trains and bus services running mostly from the neighbouring city of Rawalpindi. Lahore and Peshawar are linked to Islamabad through a network of motorways, which has significantly reduced traveling times between these cities. Islamabad is itself situated on G.T Road (N-5); in the southern patch from Highway Chowk till Swan camp and in the norther patch from Motorway Chowk till Nicholson square. Moreover, Islamabad is also situated on Rawalpindi-Srinagar Kashmir Road which is also called as N-75 from Islamabad till Kohala and Islamabad-Murree Expressway from Satra Meel, Islamabad till Lower Topa, Murree (an alternate old route is also available from Satra Meel till Lower Topa via Murree City). A national highway N-80 connects Islamabad to Kohat via Fateh Jang while a highway connects Islamabad to Rawalkot via Kahuta and Azad Patan. Another road connect Islamabad to Kolti Sattian via Lehtrar. Islamabad Highway is the main artery of the city which runs from Highway Chowk (G.T Road) till Zero point and is being changed into a signal free corridor. A patch of this Highway from Zero point till Faisal Mosque is known as Faisal Avenue (8th Avenue). Islamabad's Karachi Company Bus terminal is a busy destination and is located in Sector G-9; another newly constructed bus terminal "Islamabad Bus Terminal" has started working on Motorway Chowk. There are many privately operated transport terminals in Faizabad, Sitara Market(G-7) Terminal of NATCO Bus service (which has a fleet of bus service for different cities of Golgit Baltistan from Islamabad and Rawalpind) is located on Faqir Aipi road in Sector I-11. Islamabad's railway station (also known as Margalla Railway station) is situated in Sector I-9 which is connect to the main railway line at Nori Junction Railway station (located near Sector I-12). Golra Sharif Junction railway station of Islamabad is situated near Sector G-13 on main railway line; a railway line takes off to Multan via Western Punjab from this station. Islamabad has a multi-purpose Sports Complex opposite Aabpara. The complex includes Liaquat Gymnasium for indoor games, Mushaf Squash Complex and Jinnah Stadium for outdoor games, which is a venue for regular national and international events. 2004 SAF Games were held in the stadium. There is another Multipurpose Sports Complex in the F6 Markaz. Offered facilities include Tennis courts, a basketball court with fibre-glass boards and a Futsal ground which introduced artificial turf to the people of Islamabad. Major sports in the city include Cricket, Football, Squash, Hockey, Table Tennis, Rugby and Boxing. The city is home to Islamabad United which won the first ever Pakistan Super League in 2016. Islamabad also has various rock climbing spots in the Margalla Hills. Swimming pools of Pakistan Sports Complex are good. There are three pools for children. These facilities attract a large gathering on weekends. Few swimmers, however, demand more hygienic conditions in showers and rest rooms. 1 2 "Population by Province/Region since 1951". Pakistan Bureau of Statistics, Government of Pakistan. Retrieved 24 December 2013. ↑ "Islamabad The Capital of Pakistan". 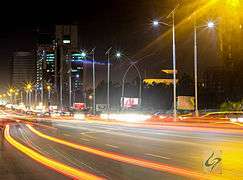 islamabadthecapital.com. Retrieved 14 March 2016. ↑ Frantzeskakis, J. M. "Islamabad, a town planning example for a sustainable city" (PDF). 1 2 "Islamabad's population touches two-million mark". The Dawn News. 7 August 2012. Retrieved 24 December 2013. ↑ "Capital Development Authority". www.visitislamabad.net. Retrieved 2016-06-07. ↑ J. Gordon Melton, Martin Baumann, ed. (21 September 2010). "Mosques". Religions of the World: A Comprehensive Encyclopedia of Beliefs and Practices (2nd ed.). ABC-CLIO. p. 1972. ISBN 978-1598842036. Retrieved 15 May 2012. ↑ Leslie Noyes Mass (15 September 2011). Back to Pakistan: A Fifty-Year Journey. Rowman & Littlefield Publishers. p. 170. ISBN 978-1442213197. Retrieved 1 July 2012. ↑ Ravi Kalia (21 April 2011). Pakistan: From the Rhetoric of Democracy to the Rise of Militancy. Pakistan: Routledge. p. 83. ISBN 978-0415670401. Retrieved 1 July 2012. ↑ "National Monument: Structure reflects history of Pakistan - The Express Tribune". The Express Tribune. 2013-08-29. Retrieved 2016-06-13. ↑ Hetland, Atle (2014-03-23). "Islamabad — a city only for the rich?". DAWN.COM. Retrieved 2016-10-23. ↑ "G-12, a sector housing rich, poor alike". The Nation. Retrieved 2016-10-23. 1 2 HEC, Pakistan. "HEC University Rankings by Category". ↑ "Safe City Project gets operational: Islooites promised safety - The Express Tribune". The Express Tribune. 2016-06-06. Retrieved 2016-06-07. ↑ "Crime rate in Islamabad drops, claim police". The Nation. Retrieved 2016-06-07. ↑ Adrian Room (13 December 2005). Placenames of the World. McFarland & Company. p. 177. ISBN 978-0786422487. Retrieved 1 July 2012. 1 2 3 4 5 "Islamabad history". Pakistan.net. 1 2 Pakistan Defence Ministry. "Potohar". ↑ "Sacred rocks of Islamabad". Dawn. 2 August 2009. Retrieved 27 June 2010. ↑ LEAD. "Background on the Potohar Plateau". 1 2 Lonely Planet. "Islamabad History". ↑ "City of Islamabad". Capital Development Authority, Govt. of Pakistan. Retrieved 17 October 2014. ↑ Carolyn Black (October 2002). Pakistan the Land. Crabtree Publishing. p. 14. ISBN 978-0778793465. Retrieved 2 July 2012. ↑ Barbara A. Weightman (15 March 2011). Dragons and Tigers: A Geography of South, East, and Southeast Asia (3rd ed.). Wiley. p. 187. ISBN 978-0470876282. Retrieved 2 July 2012. 1 2 Wolfgang Saxon (11 April 1988). "New Capital City With an Industrial Twin". The New York Times. Retrieved 1 July 2012. 1 2 Jonathan M. Bloom, ed. (23 March 2009). The Grove Encyclopedia of Islamic Art & Architecture. USA: Oxford University Press. p. 309. ISBN 978-0195309911. Retrieved 2 July 2012. ↑ CDA Islamabad. "History of Islamabad". ↑ Maneesha Tikekar (1 January 2004). Across the Wagah: An Indian's Sojourn in Pakistan. Promilla. pp. 23–62. ISBN 978-8185002347. Retrieved 12 May 2012. ↑ CDA Islamabad. "Islamabad Demographics". ↑ DAWN News. "Islamabad making history". ↑ A Reporter. "Shahbaz to inaugurate work on Metro Bus Service on Feb 28". dawn.com. Retrieved 14 March 2016. ↑ "Quake's terrible toll is revealed". BBC News. 9 October 2005. Retrieved 5 May 2010. ↑ OhmyNews. "Timeline of Suicide Blasts in Islamabad". ↑ Munawer Azeem (5 January 2012). "Islamabad saw four terror attacks last year". Dawn. Islamabad. Retrieved 2 July 2012. ↑ "No survivors as Pakistan plane crash kills 152". BBC News. 28 July 2010. Retrieved 9 September 2010. ↑ "Pakistan plane crashes near Islamabad airport". BBC. 20 April 2012. Retrieved 12 May 2012. ↑ Stanley D. Brunn; Jack F. Williams; Donald J. Zeigler (2003). "Cities of South Asia". Cities of the World: World Regional Urban Development (3rd ed.). Rowman & Littlefield Publishers. pp. 368–369. ISBN 978-0847698981. Retrieved 3 July 2012. ↑ "Islamabad Airport". Climate Charts. ↑ Yasmeen Niaz Mohiuddin (27 November 2006). Pakistan: A Global Studies Handbook (1st ed.). ABC-CLIO. p. 299. ISBN 978-1851098019. Retrieved 1 July 2012. ↑ "Urban growth monitoring along Islamabad Highway". GIS Development. ↑ "Climate Records: Islamabad". Retrieved 14 January 2012. ↑ "Internet Archive Wayback Machine". Web.archive.org. 13 June 2010. Archived from the original on 13 June 2010. Retrieved 15 January 2012. ↑ "Average Conditions, Islamabad, Pakistan". Retrieved 25 September 2009. ↑ "Severe Storms on dated 23rd July 2001 Islamabad, Pakistan" (PDF). Abdul Hameed, Director Pakistan Meteorological Department. ↑ "Weather Log – July 21–31, 2001". National Climatic Data Center. 6 August 2001. ↑ "Islamabad Climate Normals 1961-1990". National Oceanic and Atmospheric Administration. Retrieved January 16, 2012. ↑ "Extremes of Islamabad". Pakistan Meteorological Department. Retrieved February 1, 2015. 1 2 3 4 5 6 7 8 DHA Lahore. "Map of Islamabad". ↑ Anis, Muhammad (2 March 2016). "70% CDA employees to be transferred to Islamabad Metropolitan Corporation". The Nation. Retrieved 9 September 2016. ↑ CDA Official site. "CDA". 1 2 3 4 5 6 7 "The Idea of Islamabad". TheIslamabad.com. ↑ Matthew S. Hull (5 June 2012). Government of Paper: The Materiality of Bureaucracy in Urban Pakistan (1st ed.). University of California Press. p. 50. ISBN 978-0520272156. Retrieved 4 July 2012. ↑ Bahria University. "Official website". ↑ Air University. "Official website". ↑ National Defence University. "Official website". 1 2 Dulyapak Preecharushh (6 April 2011). "Myanmar's New Capital City of Naypyidaw". In Stanley D. Brunn. Engineering Earth: The Impacts of Megaengineering Projects (1st ed.). Springer. p. 1041. ISBN 978-9048199198. Retrieved 4 July 2012. ↑ Sheikh, Iqbal M.; Van S. Williams; S. Qamer Raza; Kanwar S.A. Khan. "Environmental Geology of the Islamabad-Rawalpindi Area, Northern Pakistan" (PDF). Regional Studies of the Potwar Plateau Area, Northern Pakistan. U.S. Department of the Interior, U.S. Geological Survey. ↑ "Margalla Avenue to benefit commuters of KPK, traffic on Kashmir Highway". OnePakistan. Retrieved 7 October 2013. ↑ Allison Lee Palmer (12 October 2009). The A to Z of Architecture. Scarecrow Press. p. 149. ISBN 978-0810868953. Retrieved 1 July 2012. ↑ Islamabad Stock Exchange-Official Website. 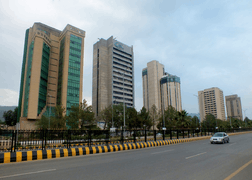 "Islamabad Stock Exchange Towers". ↑ Population Census Organization, Govt. of Pakistan. "POPULATION BY MOTHER TONGUE" (PDF). ↑ Population Census Organization, Govt. of Pakistan. "MIGRANT POPULATION BY PLACE OF BIRTH" (PDF). Archived from the original (PDF) on 13 November 2010. ↑ Population Census Organization, Govt. of Pakistan. "POPULATION BY SELECTIVE AGE GROUPS" (PDF). 1 2 "Literacy Rate" (PDF). Pakistan Bureau of Statistics. Retrieved 22 September 2013. ↑ Population Census Organization, Govt. of Pakistan. "Population by Level of Education". ↑ Population Census Organization, Govt. of Pakistan. "LABOR FORCE PARTICIPATION RATES" (PDF). ↑ Population Census Organization, Govt. of Pakistan. "UN-EMPLOYMENT RATES" (PDF). ↑ Population Census Organization, Govt. of Pakistan. "POPULATION BY RELIGION" (PDF). ↑ "Pakistan | Economics and extremism". Dawn. 5 January 2010. Retrieved 2 June 2010. ↑ ISE-Official website. "About ISE". 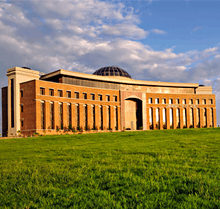 ↑ "Rs 371bn revenue target: FBR hails LTU Islamabad's performance". Business Recorder. 5 July 2012. Retrieved 9 July 2012. ↑ Pakistan Software Export Board. "Islamabad". 1 2 Ministry of Tourism, Government of Pakistan. "Forts of Pakistan". ↑ "Sidpur Village". The Daily Times. ↑ Huma Khawar. "Spotlight Bari Imam". Dawn News. ↑ Viamigo. "RAWALPINDI/ISLAMABAD CITIES TOUR". ↑ Charles S. Benson (1972). "New Cities and Educational Planning". In Dennis L. Roberts. Planning Urban Education: New Techniques to Transform Learning in the City. Educational Technology Publications. p. 111. ISBN 978-0877780243. Retrieved 3 July 2012. 1 2 3 4 5 AEPAM. "Pakistan Education Statistics 2008–09" (PDF). ↑ TheNews website. "Punjab tops in infant mortality, poverty, income inequality". ↑ PIMS-Official website. "About PIMS". ↑ PIMS-Official website. "Departments at PIMS". ↑ PIMS-Official website. "Islamabad Hospital". ↑ PIMS-Official website. "Children Hospital". ↑ PIMS-Official website. "Maternal & Child Health Care Center". ↑ PIMS-Official website. "Quaid-i-Azam Postgraduate Medical College". 1 2 PAEC General Hospital-Official website. "About PAEC Hospital". ↑ PAEC General Hospital-Official website. "Functions of Major Departments". ↑ SHIFA International Hospital-Official website. "SHIFA History". ↑ Federal Bureau of Statistics. "Hospitals/Dispensaries and Beds by Province" (PDF). ↑ Geo News. "PM names Islamabad Airport as Benazir Bhutto International Airport". ↑ United Impex. "International Air Ports in Pakistan". ↑ A-Z World Airports. "Islamabad – Benazir Bhutto International Airport (ISB/OPRN)". ↑ CPG Corporation. "New Islamabad International Airport's Passenger Terminal Building". 1 2 National Highway Authority Pakistan. "Motorway's of Pakistan". ↑ M. Hanif Raza (1985). Islamabad and environs. Colorpix. p. 83. ASIN B0006ENJ0I. ↑ "ARY Digital Network President Salman Iqbal congratulates Islamabad United over winning PSL". arynews.tv. Retrieved 24 February 2016. ↑ Arran, John (2012). "A Guide to Climbing in Margalla" (PDF). Rock Climbing Islamabad. Pakistan Alpine Institute. Retrieved 12 October 2013. ↑ Beijing International-Official website. "Sister cities". ↑ Fazal Sher - Daily Times. "Islamabad, Seoul to be made sister cities". ↑ "Twin towns of Minsk". © 2008 The department of protocol and international relations of Minsk City Executive Committee. Retrieved 2008-12-08. † See: Positions on Jerusalem. Both Israel and Palestinians claim Jerusalem as capital. Jerusalem contains the Israeli parliament and almost all Israeli government ministries. Tel Aviv contains most foreign embassies in Israel; Ramallah is the administrative seat of the Palestinian Authority. + According to the 1947 Constitution of the Republic of China, Nanjing is the official capital of the ROC, with Taipei as the seat of government. See also Political status of Taiwan.